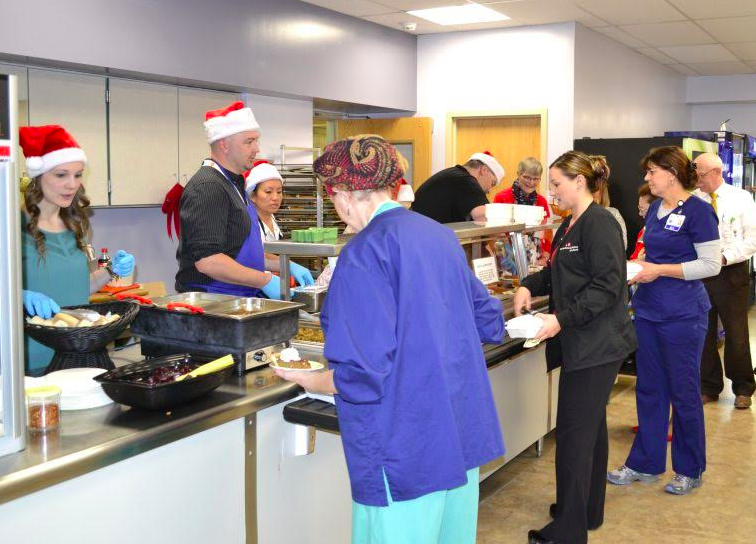 Scott Foster (center), Franklin Memorial Hospital employee and Board of Director for FCCOC, serves meals. FARMINGTON - We invite the public to join us for the fifth annual Meal for a Meal at the Franklin Memorial Hospital cafeteria on Nov. 28 from 11:45 a.m. to 1 p.m. The cafeteria will provide a full holiday meal for a donation to go toward the Franklin County Chamber of Commerce’s Gerry Wiles Holiday Food Basket Program which distributes holiday food baskets to residents from Rangeley, Eustis, Carthage, Livermore, and all points in between who meet federal eligibility guidelines for food insecurity. The meal raised $1,721 last year which provided 68 meal baskets for the food basket program. The goal for this year is $2,000. FMI call 778-4726. What an amazing concept - it is a win for everyone - I hope more community members will participate and raise more $$$$ for a great cause.